I've pointed this out before but I'll do it again. Yuzu's major is very advanced and technical. Cognitive science involves grounding in psychology, sociology, neurology, computer science, mathematics and philosophy. It's demands are great but when has Yuzu ever not taken up a challenge? Yuzu's already begun applying some of its principles by mathematically breaking down some skating moves and such. When's the last time a skater has analyzed moves he's making by using calculus to increase his understanding of it? We have to realize that if Yuzu weren't a world class skater most people would describe him as a nerd or geek. That distinction doesn't phase Yuzu in the slightest. I have a feeling that when Yuzu goes through commencement at the conclusion of his studies the ceremony will be broadcast live, further proof that for many Japanese Yuzu is more than a skater. It's that element, the element that makes Yuzu so popular beyond the realms of figure skating fandom that I feel makes the fans of other Japanese skaters so angry. They know that there is no way their skater can match up against Yuzu when it comes to qualities beyond simple skating skills. Quite simply, Yuzu is a superior human being. Yuzu has himself a great deal of power, if he'd only learn how to use it. He has endorsement contracts with some powerful skating financers, particularly P&G. The threat of his retiring would be something they would not like to see any time soon. Competition organizers, who when Yuzu is competing can count on sell-outs at least for the men's events, value his presence (even if it means bringing in an extra contingent of flower kids to handle the Poohbursts). He should simply say that if the disadvantageous scoring continues he'll consider retiring to avoid the hassle. Of course I know, as all of you also, that Yuzu wants to compete as long as it remains possible for him to bring in the gold. In basic monetary terms Yuzu is worth considerably more than any other male skater out there. He should take advantage of that, wanting the scoring simply to be fair and not put to his advantage. It has been said that one should walk quietly but carry a big stick. Yuzu has a big stick and he should realize there are some times one needs to use it. Yuzu has the financial resources to have his clothing expertly tailored for him, and by that I mean created from scratch. He should go that route for formal and semi-formal dress but I think athletic casual would be his informal dress, particularly since that seems to be his preferred mode right now anyway, I have a feeling that Yuzu's mindset is such that unless he's engaged with a video-game or at his studies he's in 'training mode', meaning he's either engaging in physical activities oriented around what he needs to accomplish physically or is mentally dealing with tasks directly tied into his skating needs. My suspicion is that Yuzu allows for no wasted time and he has articulated for himself goals he's pursuing, not simply for on ice but for his life off the ice. One thing is apparent about Yuzu - he does not like disorder in any aspect of his life. I know what you mean about Kurt. Several times he has said things that I knew just by comparison with his normal commentary had been written and were waiting for just some opportunity to be inserted into his comments. They stuck out like the fabled sore thumb. Beyond that, though, I have noticed he has real respect for Yuzu and while not a member of the GOAT chorus he has never dismissed Yuzu's achievement as anything less than consequential. I remember one time when he remarked that Yuzu was the only person he knew who could have the audience absolutely riveted on him even when he's standing in the middle of the ice doing absolutely nothing. I'm back!!! And things are not nearly as bad as I originally feared. Ultra-sound of my heart showed a slight flaw in one part but the doctor said it was inconsequential. The x-ray of my lungs showed nothing wrong there. Worries about blood pressure were pretty much dismissed as while I did have sky-high blood pressure when transiting to the hospital once there the pressure was marginally high now and then but by and large I was landing in the good to very good parameters. The extreme edema in my legs has been vanquished and I am now on a regimen to keep it from returning. The one last major problem, my extreme weakness, has me now beginning what may be several weeks of intense rehabilitation. Needless to say my spirits are immeasurably improved. Next thing - really want to thank everyone for the many messages of support I see posted here. I did not think I was that highly regarded here although I can say I have always tried to be of use to the Planet. I realize that my writing and intellectual skills are very well-developed but like Yuzu I try to remain humble and to use them in order to contribute ideas and observations that I think will be of interest to others. I have received a few personal messages over time by some thanking me but I need no thanks. The Planet has been for me a means to reach out to others who share my intense admiration for that very remarkable human being - Yuzuru Hanyu. And it has also been an invaluable resource to learn not only about Yuzu but figure skating in general. Now the good part. A perusal of the general drift of discussion about Yuzu seems to me to be trying to identify precisely what it is that makes Yuzu so remarkable, leaving aside his supremacy as a skater. Quite rightly there can be no argument about Yuzu's achievements on the ice. They are beyond compare and though Nathan might seem to be in the ascendant right now anyone who has an unbiased view of recent men's skating history knows that Nathan can't compare to Yuzu. But I won't go into details here. They've been already discussed on this forum. The im;portant thing to remember is that Yuzu is still the person all the other men are skating against in their training. LIke Johnny Weir once said - Nobody can beat a perfect Yuzuru Hanyu. If Yuzu skates with the quality he displayed during those record-rewriting two weeks in late 2015 there is nobody who can touch him. For us fans of Yuzu of course, we know that that scale of perfection is not something he routinely achieves although he does so often enough to have much of the skating commentariat seeing him as the GOAT or at least the best candidate for that status currently skating. The real issue currently under discussion is what it is that makes Yuzu so admirable for those who aren't figure-skating fans, those factors that make him and exemplar of the best of humanity in general. I've stated before but it can't be restated often enough. Yuzu's greatness lies in his sense of noblesse oblige, his sense that the exalted position which the admiration of the masses have placed him entails a responsibility to give back to them what he can to justify their admiration. Thus we have the visits to schools, to senior centers, to other venues, where, like members of the British royal family, he tries to help others who are not in such a privileged position as he possesses. Add that his conquest of the many challenges he has encountered, beginning with the earthquake but also his overcoming his all-too-frequent injuries, what emerges is the truth that there is something essentially heroic about Yuzu. He has slain no dragons but he has conquered situations that readily compare to dragons. Yet above all there remains that humility and openness that is so characteristic of Yuzu, that we see all so often in the kiss and cry as he awaits the judges scores and seeks to acknowledge his coaches and his fans. Yuzu is not afraid to shed tears and that fact, above all, reveals the openness that makes him so special. I could go on and on but the basic fact is that Yuzu is far more than a skater to his adoring fans. The only other athlete who possesses that same mixture of excellence and humility that Yuzu possesses is Wayne Gretzky. Both are national treasures in their respective countries, perceived by the peoples there as exemplars not only of athletic excellence but of human excellence. I think it is that fact that most riles those in Japan who admire others skaters. They know there is no way that their favorites can ever be viewed in the light that Yuzu is. Yuzu's brand of humanity is one that, unfortunately, is in very short supply in today's world, and it is the recognition of that fact that makes Yuzu's fans the fans they are. Everybody, for those who believe in the power of prayer, I need all that I can get. I'm about to head to the hospital in order to have a number of things checked into and actions taken to ameliorate them. There are more than one issue involved so I don't know how long I'll be there. I'll be out of touch since I have no cell phone or tablet so I'll reestablish contact once I'm back home. Until then a grand silence from these quarters. This forum has become very important to me and I hope there will be some years left for me to continue to be a part of it so you can take heart from a line spoken by Arnold Schwarzenegger - I'll be back. What we have to remember about Yuzu is his undoubted integrity and desire that all who compete against him do as well as possible. He wants to win by committing his clean skate after everyone else's clean skate. What we also have to remember is that it's basically only the American media buying into the notion that Nathan Chen is now the number one skater. Yuzu is still the skater other skaters train against, not Nathan. True number one is not a function of victories but of the notion of 'the one to beat'. That remains Yuzu and all the other skaters know that Nathan would not have beaten a Yuzu not skating through recent injuries. Nathan lucked out by skating against a Yuzu who was, as at the Olympics, skating on pain-killers. That is not a true victory, just as Shoma knows his three consecutive Japanese championships all have an asterisk, an asterisk symbolizing Yuzu wasn't there. As for judging, I think the message should be getting around that the judges are also being judged by the figure-skating fans, not just of Yuzu but of others (except perhaps the Americans). They want fairly-judged competitions. Other skaters want clean judging also since only with clean judging can their own achievements have credibility. While Nathan's skating is impressive, it would be nothing without his aerial antics and if a contest were held between Yuzu and Hanyu where no jumps are allowed Yuzu would clean up. In any case the season is now completed and the ice show season is just ahead. Except for Sendai I hope Yuzu stays away from the shows this summer and works extra hard to get his injury behind him and goes into next season with a clean bill of health and a resolve to skate as safely as possible in order to still remain competitive. I do think it imperative that he put together two programs that are intended to highlight his artistry as much as his athleticism. He did that with Otonai but I think he didn't quite pull it off with Origin. He needs a program with the power of RJ1 or POTO to claim the spotlight. Those were programs with over-the-top dramatics. I think also he should return to the spirit of PW and LGC for his short. Those two programs really highlighted the 'bad boy Yuzu' that every now and then surfaces. But to reiterate, we need a Yuzu who spends these next few months healing completely and then competing wisely to avoid yet another injury. Yet another abbreviated season is not what Yuzu's biography needs. We need a clean season with clean wins everywhere his skates touch the ice. In short, we need the Yuzu of 2009/10, Yuzu's last season on the junior level where, according to one commentator, he won 'everything in sight'. I would think a bus tour of Sendai would pass by IceRink Sendai. It's undoubtedly a pilgrimage destination for Yuzu fans visiting Sendai (and I would say they comprise a hefty portion of those visiting the city). I guess I must have missed something. I didn't think Yuzu was going to do ice shows this summer in order to fully recover. So he is going to do the shows, which means the producers must be paying top money to have him. As always he's the unofficial headliner. When's the last time Yuzu was not the last introduced in the opening of an ice show? Has to be ancient history. I'm not Japanese but I'm aware of the importance of this, not simply because it is the present emperor's 30th anniversary as Emperor but also that it is his last. On the 30th of April he will be abdicating the throne (due to age, his idea) and his son will ascend to it. Thus this anniversary is very important and it's quite an honor for Yuzu to be invited to contribute to this volume. I'm certain most of the messages will be thanking him for his service and wishing him well for his remaining years and each will have it's own additions. Yuzu might thank him for any special attentions he (the emperor) may have given to the reconstruction effort and other measures of support and perhaps also to the two times he met the emperor (the emperor's garden party) after his two Olympic victories. 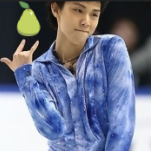 As with all things Yuzuru it will be well thought out and totally sincere. Spare Us, Please!! In any case I don't think it's even possible for a fellow who shows no trace of beard and who, as far as I've been able to see went from boyhood through adolescence to manhood without a single zit. What's his secret? (PS, I almost did myself since most of the time with me during those years I was without blemish, so it is possible). For those wondering about Patrick's declaration I have to admit that this came to me as second-hand information. I can't cite when and where he is said to have made the statement. I will say, however, as I look at the field of up-and-coming skaters in Canada it is clearly evident that Stephen is the one who the skating establishment there feels holds the most promise. Everyone is worrying about growth spurts and such although my information says he's already gone through one with nary a problem (at least none to be seen in his skating). Young male skaters are not inevitably going to be sidetracked by their suddenly growing bodies. I see no evidence of such happening to Yuzu as he moved from boyhood to manhood. In any case the good folks at TCC were made super-aware of the problems of adolescent explosive-growth through their experiences with Nam and they took those experiences to heart and are making sure they are ready for anything Stephen's maturing body might throw at them. I can see him signing perhaps those five big winners but I can't imagine Yuzu, as determined as he is to be genuine, signing an additional thirty-five hundred items. The signatures, however, might be the contest authorities' means of saying this is a Yuzu-approved operation. The best testimony to that is Sochi. Yuzu was never satisfied with his victory there. He knew that he went gold because of the high margin he carried over from his short program and the fact that he made less mistakes than others in the long. That's why he so much wanted a 'clean' win at PC, which he did receive and so was satisfied. Yuzu is always his tenth judge and he is just as hard on himself as the other nine are although he's honest and knowledgeable about his self-criticism, unlike the other nine.